Let’s suppose you start a company and ready the release of your first product based on a new technology. Surprise: you don’t really want thousands of new customers on day one. Really. Rather, goal #1 should be to make sure that your company and your product are running smoothly (seriously). You need to test out the system – does the product work as promised? Does it fulfill the right needs? Oh – and will people and/or companies be willing to actually pay you (a reasonable price) for it? Hard to believe but at this point, you really, really don’t want marketing. Your worst nightmare would be thousands of prospects lining up to buy a new product… that doesn’t work! Think of those support calls! And the returned product! And miserable employees. Instead, line up your first customers and work closely with them to understand their challenges, needs and required product updates. Better to gain a few solid reference-able customers than a thousand unhappy ones. Don’t worry, you’ll get there. Now, fast forward. Your product is selling to a solid group of Innovators and Early Adopters who want to use it to drive innovation in their companies. They need to know that your product performs as advertised and they need to know its technical capabilities. They’re smart enough to figure out what to do with it, and they’re willing to take a risk on your technology to do that. Sure you can talk vision. But this is the perfect time to market your product’s raw technology, features and capabilities. As the market matures further, the next groups will be more demanding – and less sophisticated. The Early Majoritymay know they’re buying technology but they’re more interested in your technology’s ability to solve their business problems. And they need you to figure out what this means rather than doing it themselves. The trap: at this point, most tech companies are so wrapped up in their technology and its early success that they focus on marketing the product rather than demonstrating how they solve a business problem. But this is the time to shift marketing from efforts from products to more complete solutions. Pick a limited set of solutions to offer, build out those solutions and their supporting product capabilities, wrap then in a tech and services ecosystem, and expand the solution list as you and the market grow further. This is Moore’s Bowling Alley. Whoa – It’s a Tornado! You may be able to pull back on marketing once you hit the Tornado – and before the tide starts to turn down. For this time, capture all the sales you can – but be prepared to shift back to solution marketing as you hit the Late Majority. 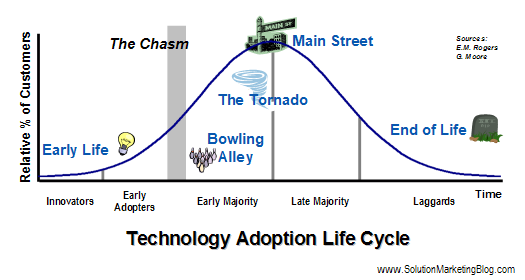 As in the beginning of the technology life cycle, The End may signal time to market products – again. As the technology coasts toward end-of-life, more prospects will actually understand the raw technology itself and won’t require your help to figure it out. So as you can see, oftentimes, depending on the technology’s maturity, the best way to sell more product may be to market solutions, products, or neither.